What is it with the little stockings? I have no idea. I actually made these last year but with the knit and felted versions already posted, it seemed too much to post yet another variation on the theme. They're as fast and easy as possible: cut out of felt (in one case, a felted sweater) with pinking shears and sewn around the edges. They could be filled with tiny candy canes and hung on a tree. I played around with adding numbers for advent calendars, too. 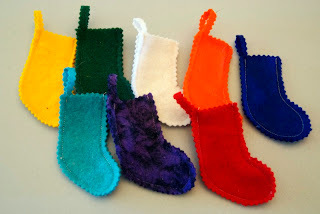 It got me thinking about family stockings. Ours are made from old jeans and prequilted fabric, because the first Christmas D and I spent as a married couple found us in Singapore with only a treadle sewing machine and some castoff clothing to work with. I had rudimentary sewing skills at best but thought of these as temporary placeholders until I had better ones. 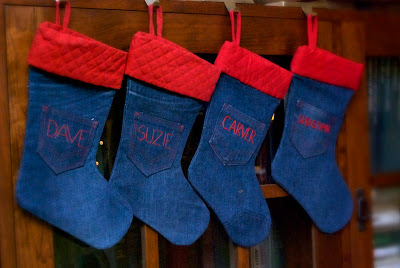 With each baby came a new denim stocking: jeans are always available, and it was easier to add one stocking than to redo all of them. But by now I was thinking about knitting Christmas stockings someday. By the time "someday" came around, however, the boys had already grown used to their funky blue stockings and didn't want anything else. It turns out they were especially fond of the little pocket in front. But apparently I still think about stockings. A lot. Stockings are fun—they conjure up the feeling of waking up on Christmas morning, the surprise of digging down and pulling something up, and the pleasure of seeing our family names hanging side by side on the...well, we don't have a fireplace, so ours are on a bookcase. And stockings are such a perfect canvas for customizing. You can make them from anything, in any colors, with any embellishment, any size or shape—just look at what comes up on flickr, for example. 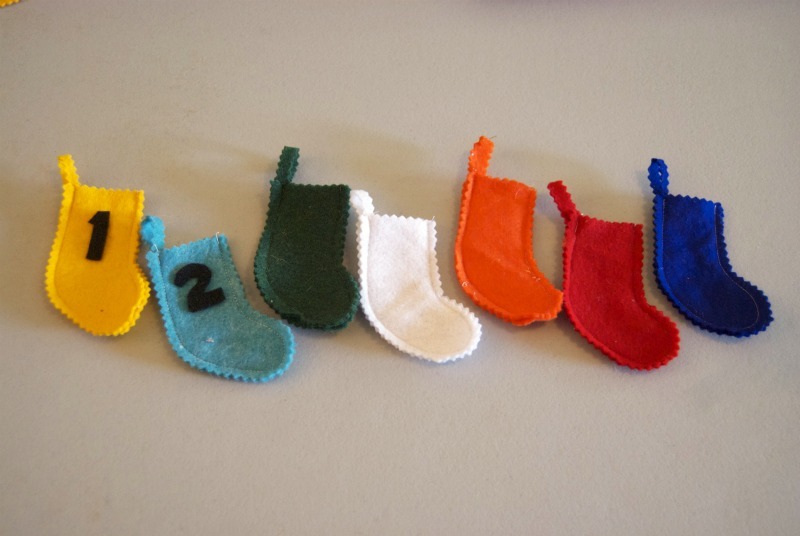 I guess I've always been partial to wool myself, which is why I keep coming up with tiny wool stockings. But ours are denim, and I guess always will be. 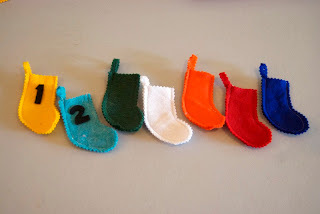 Do you hang stockings this time of year and if so, what is their story? Wish ours had as much sweetness. None for adults, just kids, dogs of course, included. Ariel always loved hers and would wait anxiously until someone took it down and let her see what was there, so stockings will be bittersweet for me this year. I'm sorry--I really am. I guess that's the flip side of stockings feeling like stand-ins for the family members.